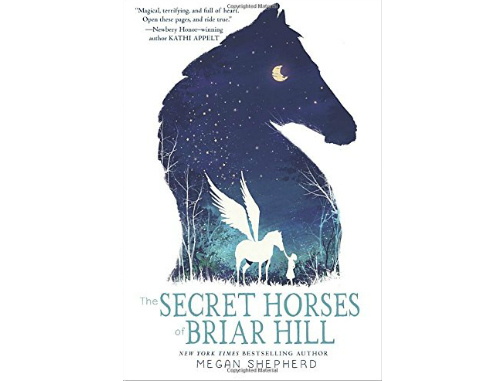 Described as "reminiscent of the Chronicles of Narnia" in a starred review, The Secret Horses of Briar Hill shows readers everywhere that there is color in our world--they just need to know where to look. There are winged horses that live in the mirrors of Briar Hill hospital -- the mirrors that reflect the elegant rooms once home to a princess, now filled with sick children. Only Emmaline can see the creatures. It is her secret. One morning, Emmaline climbs over the wall of the hospital's abandoned gardens and discovers something incredible: a white horse with a broken wing has left the mirror-world and entered her own. The horse, named Foxfire, is hiding from a dark and sinister force--a Black Horse who hunts by colorless moonlight. If Emmaline is to keep him from finding her new friend, she must surround Foxfire with treasures of brilliant shades. But where can Emmaline find color in a world of gray?